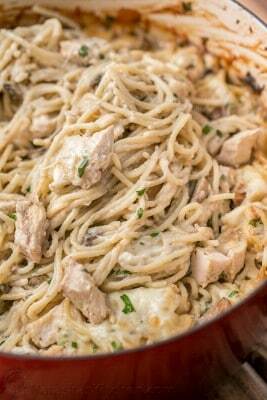 This chicken tetrazzini is comforting and supremely creamy; a cheesy pasta bake loaded with juicy chicken and plump mushrooms. Preheat Oven to 350˚F. Cook pasta in a large pot of salted water until aldente according to package instructions then rinse to stop the cooking process, drain and set aside. Cut 4 cups of chicken meat from a rotisserie chicken and shred into bite-sized pieces and set aside. Place a large dutch oven or pot over medium/high heat. Add 2 Tbsp oil then add sliced mushrooms and sauté 3 min or until softened. Add diced onions and cook until onions are soft and golden, 5-7 min. Add minced garlic and sauté another 1-2 min until fragrant. Remove to the cutting board with chicken. In the same pot, melt 4 Tbsp butter and whisk in 1/3 cup flour until lightly golden (1 1/2 min). Add 2 1/2 cups chicken broth, 1 Tbsp lemon juice, 1 tsp salt, 1/4 tsp pepper and whisk until smooth. Add 1 1/2 cups half and half and bring to a simmer. Season sauce with more salt and pepper to taste. *To cook your own chicken: in your dutch oven or pot, melt 1 Tbsp butter and 1 Tbsp oil over medium-high heat. Season 2 lbs chicken breasts with about 1/2 tsp salt and 1/4 tsp pepper. Once oil is hot, saute chicken until golden brown on both sides and cooked through (about 4 min per side). Remove to cutting board to cool then cut into bite-sized pieces.